Creamer Media's Energy Roundup is a monthly report providing a synopsis of energy-related news from South Africa during the past month. 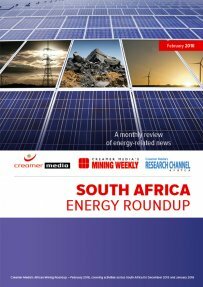 The February 2016 roundup covers activities across South Africa for December 2015 and January 2016 and includes details of a Government Gazette notice that confirms Cabinet’s decision to move ahead with the 9 600 MW nuclear procurement programme; State-owned power utility Eskom’s decision to migrate to fixed-price coal contracts; and Eskom’s new Medupi project director. Published on: 04 February 2016.